My name is Paddy McKeown, I am a retired police officer (Detective Sergeant – Metropolitan Police), turned chimney sweep. I have completed training with ‘The Guild of Master Chimney Sweeps’, and Rod Tech UK (Power Sweeping). I have built up a wealth of practical knowledge and experience, and have invested in a range of sweeping equipment including CCTV equipment to examine and record the interior condition of flues/chimneys and so can diagnose and advise on all sorts of chimney problems and carry out minor repairs if necessary. I sweep cleanly and efficiently all open fire places, as well as wood-burning stoves, Aga’s, Rayburn’s Alpha’s, Parkray’s, Baxi’s, inglenooks and biomass boilers. Put simply, I offer an inclusive sweeping package that will guarantee your safety whilst you get the best out of your appliance or open fire. It may be of interest to my customers to learn, that along with domestic chimney sweeping, I also industrial and commercial sweeping. Here is an example of such work; I recently swept the chimney of this large biomass boiler that is on an estate in Cambridgeshire. 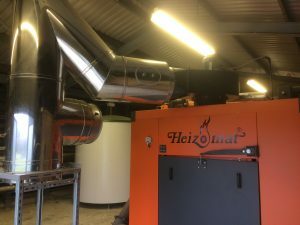 This biomass boiler runs by burning wood-chips, much as you would find at any garden centre. The wood chips are stored in a hopper in a very large barn like shed and are interestingly fed into the biomass boiler in the shed next-door by a large Archimedes screw. The biomass boiler is so efficient the only deposits from the burning process are a very fine, black, talcum powder like ash which automatically falls into a standard wheelie-bin. It takes over a month for the biomass boiler to fill the wheelie-bin with ash! Somebody still has to empty the wheelie-bin though! The biomass boiler chimney was seven and a half metres tall and had a diameter of 38cm; I swept it using manual rods and brushes. In addition I also had to sweep the fan housing to the chimney; I did this using my long handled sweeps brush.